Visit enough log homes and there will be no doubt in your mind about the value of proper wood refinishing. Left unprotected, a little rain and intense sun is all it takes to make regal lumber look abandoned. To avoid warped wood and the dreaded fade to gray, you have your choice between oil-based and water-based (acrylic) stains. Both have their advantages, but to get a sense of proper acrylic application and the potential benefits of water-based, we spoke with Scott Roesner, sales and marketing director for Structures Wood Care, for an inside look at acrylics. LHL: What is the first thing a home-owner who’s opted for an acrylic stain should do? Scott: One very important thing to keep in mind about acrylic is the preparation. Acrylic finishes dry very quickly, which is great because that allows you to re-coat in 2 to 4 hours. However, this quick-drying factor doesn’t give it much time to penetrate into the wood grain. You must give the product something to grab hold of so it can bond with the logs. Giving the wood a scuffed surface to adhere to is the best way to do this. Scuff-sanding isn’t bearing down on the wood so much that your shoulders and arms become very sore. Scuffing means to remove just enough of the surface wood that it feels rough when you run your fingers across it. I tell everyone that you should “scuff” sand the wood with 40- to 80-grit sandpaper on a random orbital sander. LHL: After sanding, what’s the next step? Scott: When the sanding is done, I recommend you wash the surface to remove the dust and any possible surface contaminates. Use a quality siding wash or a mixture of TSP (trisodium phosphate), bleach and water. It’s very important that the cleaned surface dry for at least three solid days. You don’t want to trap moisture behind the new finish you are putting on! LHL: Besides a quick drying time, what are other benefits of acrylics? Scott: One big benefit to acrylics is that they don’t tend to darken year after year. Acrylic resins are naturally resistant to the effects of ultraviolet rays. 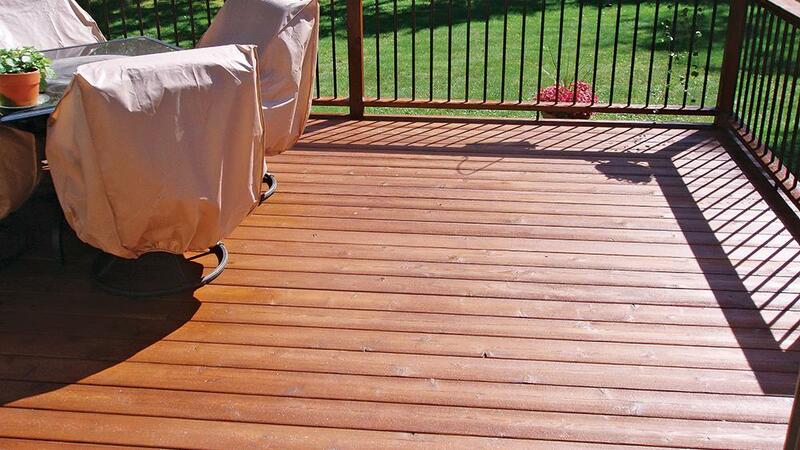 They provide a very hard but flexible surface that is extremely good at protecting your wood from both sun and water. A good exterior acrylic stain will also contain extra UV inhibitors, along with a fungicide and mildewcide that deters the growth of those contaminates on your finished surface. LHL: Is any upkeep required? Scott: As with any exterior finish, you are going to have to do maintenance coats. The time required between this additional coat in the future is going to be directly related to your exposure to the sun, water and how often you wash your surfaces of contaminates. LHL: Is acrylic an environmentally friendly finish? Scott: A couple of the friendliest environmental attributes of an acrylic is that it is VOC compliant in all 50 states. In other words, no offensive odors. The second benefit is it has the ease of soap and water cleanup, rather than requiring harsh chemical cleansers. LHL: How can you ensure you get the most out every coat? Scott: The best advice I could give anyone is to apply your product with a good-quality brush. This is going to give you the best and longest lasting coating you can expect. It will also give you the ability to “feel” if there is too much, or too little, product being applied. In addition, brushing will allow you to work extra product into the cracks and the knots without having ugly drip marks later. LHL: Is there anything a homeowner should absolutely NOT do? Scott: Do not apply an acrylic finish to a dirty and/or smooth surface. You’ll only be asking for your beautiful project to fail much too early. After all your time, energy and investment, no one wants to see that.